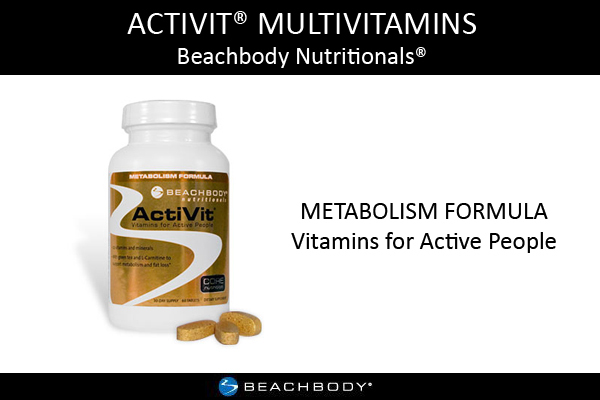 Metabolism Formula | Beachbody Nutritionals® Vitamins for active people. Two tablets a day with any meal. Metabolism Formula is perfect with our Meal Replacement Shake for optimal, healthy weight loss. Many multivitamins only contain the Daily Value (DV) of nutrients, which is the minimum amount recommended for basic health and may in fact be less than what active adults need. The balanced nutrient content in ActiVit Multivitamins exceeds the DV for specific nutrients to give your body enough of what it truly needs to help maintain optimal health and fitness levels. WARNING: Consult with a healthcare professional if pregnant, breast feeding, providing to a child, or if you have any other unique or special needs. Keep out of reach of children. *These statements have not been evaluated by the Food and Drug Administration. This product is not intended to diagnose, treat, cure, or prevent any disease.